Lynnwood, WA: This week history is being made as a group of climate activists are helping to put lack of action on climate change on trial. According to the Climate Disobedience Center, the five defendants known to supporters as the Delta 5, will call expert witnesses including a co-author of the UN’s intergovernmental panel on climate change report and a rail safety expert, to convince the jury that the threat posed by climate change justifies their acts of civil disobedience. “There came a point where I could no longer sit back and wait for the politicians to act. I had to put my body on the line to demand not talk, but action on a massive scale to rapidly replace fossil fuels,” said Patrick Mazza, a member of the Delta 5 who has worked for years as an advocate for climate action. This is the first time a U.S. court has heard a ‘necessity defense’ in a case relating to climate action. The trial is schedule to last the duration of this week. See the full trial press release. Before the trial began Monday, Tim DeChristopher of Bidder 70 fame and co-founder of the Climate Disobedience Center supporting the defendants, and defendant Abby Brockway spoke with Democracy Now! about the significance of the case. DeChristopher is live tweeting from the trial at @DeChristopher. Just got word that the Delta 5 judge reversed his decision, and they will be able to use necessity defense in their #climatetrial next week. Next week, on January 11th, the activists known as the Delta 5 are going to trail for their civil disobedience. A year ago, in September 2014, they blocked a train used to transport oil at the Delta rail yard in Everett, WA. This is yet another instance of average citizens people like you and me putting their bodies in the way of business as usual for the fossil fuel industry. Perhaps something we all need to be doing as the fossil fuel industry seems “hell bent on killing the planet” to quote Bill McKibben. In this video the Delta 5 — that’s Abby Brockway, Mike Lapointe, Patrick Mazza, Jackie Minchew, and Liz Spoerri — explain why they took this action. Wherever you are, you can help these activists by following the trial, sharing related news, and if you can, support their legal fund. Share some of the Facebook posts from the Climate Disobedience Center. Learn more about the Delta 5 case on their website at delta5trial.org. Climate Change: An Invitation to New Life? An inspirational and challenging talk from TedxNewBedford by Climate Disobedience Center founder, Jay O’Hara. The climate crisis pushes us into an existential crisis of the soul. While it is natural for us to shirk that discomfort, Quaker and climate activist Jay O’Hara suggests embracing that loss is the gateway to powerful action. Through the lens of his own loss and action, he exposes the paradox of faith that may give us the chance to build the new world we need, and the movement needed to get us there.Jay O’Hara is a Quaker and native of Cape Cod. Inspired by Wendell Berry, he moved back to his hometown in 2007 to pursue a faithful response to the climate crisis, while working as a sailmaker. He is the founder of Climate Summer, a transformational summer training program for student climate activists. Called to bolder action to stop the burning of fossil fuels, in 2013 he, along with Ken Ward, blockaded 40,000 tons of coal destined for the Brayton Point power plant with their small white lobster boat named the “Henry David T”. The ensuing legal proceedings garnered national attention when Bristol District Attorney Sam Sutter reduced and dismissed the charges against the two, calling climate change “one of the gravest crises our planet has ever faced“. Most recently he co-led the faith-based “Pipeline Pilgrimage”, and has co-founded the Climate Disobedience Center with members of the Lobster Boat Blockade team. Over 600 artworks critiquing the corporate takeover of the COP21 climatetalks were installed in advertising spaces across Paris this weekend -ahead of the United Nations summit beginning Monday 30 November. The artworks were placed in advertising spaces owned by JC Decaux -one of the world’s largest outdoor advertising firms and an officialsponsor to the COP21 climate talks.Other prominent corporate sponsors of the climate talks such as AirFrance, GDF Suez (Engie) and Dow Chemicals are parodied in the posters -whilst heads of state such as Francois Hollande, David Cameron, BarackObama, Angela Merkel and Shinzo Abi also feature. Elan continued, “We are taking their spaces back because we want tochallenge the role advertising plays in promoting unsustainableconsumerism. Because the advertising industry force feeds our desires for products created from fossil fuels, they are intimatelyconnected to causing climate change. As is the case with the Climatetalks and their corporate sponsored events, outdoor advertising ensuresthat those with the most amount of money are able to ensure that theirvoices get heard above all else.” The art works were installed on ‘BlackFriday’ or ‘Vendredi Noir’; the most hectic and competitive shopping day of the year . 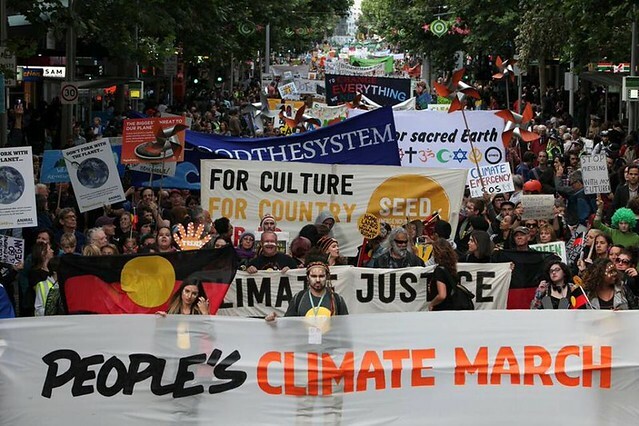 Other posters called on people to take to the streets as part of the”Climate Games” – the world’s largest disobedient adventure game  as well as protesting the “Solutions 21” conference – a large corporate exposition being held at the Grand Palais during the climate talks . Dismaland was an illicit exhibition organised by Banksy which involved prominent artists from around the world. At Dismaland, therewas an advertising-takeover installation and a distribution of’hackpacks’. More info here: dismaland.co.uk. The Dismaland artists thatwere involved in this COP21 intervention are Neta Harari, Jimmy Cauty,Paul Insect (shares studio with Banksy), Escif and Kennard Phillips. On Black Friday, retailers offer large discounts to promote sales.The concept originated in the US and flew over to Europe in the lastyears where it is gaining popularity. It is known to cause violence(including deaths) in front of and inside shops. See more on this here:http://www.independent.co.uk/news/world/americas/death-counter-records-number-of-people-killed-or-injured-on-black-friday-a6731766.html The 27th of November is also ‘No Ad Day’ an artist led initiative thatseeks to remove ads from public spaces across the world. 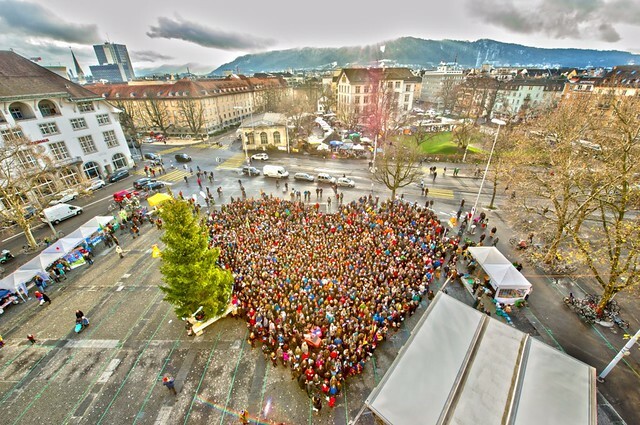 On Sunday, November 29, on the eve of the COP21 climate talks, more, more than 10,000 protesters gathered to form a human chain despite protests being banned following the recent Paris terror attacks. Video is all music, so don’t let French title scare you. Watch it, share it, soak in the solidarity, and know that you are not alone in this fight! Together we are powerful. Thanks to Vincent Verzat for this fabulous video!